Photograph of the John Irwin Clothiers, 108 E. Prairie St., Decatur, IL. Mr. Irwin, who lived at 366 W. Decatur Street, was apparently out of business in 1891, according to the directory. The children of John Irwin, and his wife, Alta Barber Irwin, were Miss Aldyth Irwin, who died in 1937 in Los Angeles, and Mrs. Lillian Irwin Gingrich, who died last August in Alhambra, Calif. Photo by Piper. Photo Ran Mon. Aug 7, 1950. There is additional on the photo. 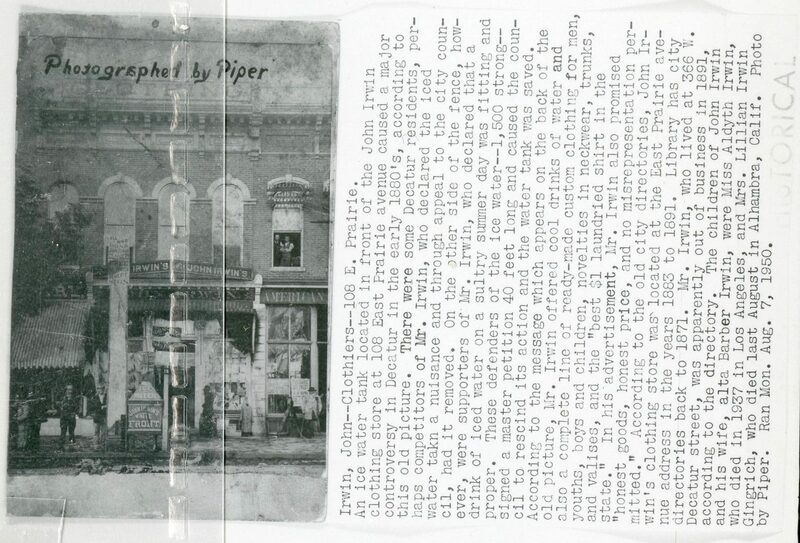 Business, Buildings, Clothiers, Photo File: Business, Biography, Decatur, IL. 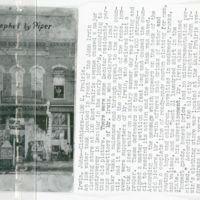 Photographed by Piper, “Photo of the John Irwin Clothiers,” Decatur Illinois Public Library Local History Photo Collection, accessed April 24, 2019, http://omeka.decaturlibrary.org/items/show/2767.